Lakshmi is commonly portrayed as a beautiful woman with four arms, standing on a lotus flower... - BBC. 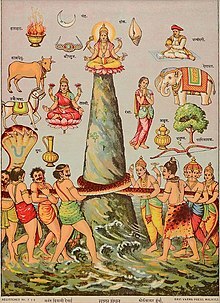 One of the most compelling stories in Hindu mythology is that of the Churning of the Milky Ocean. It is the story of the gods versus the demons and their fight to gain immortality. It also tells of the rebirth of Lakshmi... - BBC. Lakshmi, the Goddess of wealth, comes of Her own accord where fools are not respected, grain is well stored up, and the husband and wife do not quarrel. The Goddess of wealth is unsteady, and so is the life breath. - Chanakya. Lakshmi also spelled Laksmi, (Sanskrit: लक्ष्मी lakṣmī, Hindi pronunciation: [ˈləkʃmi]) is the Hindu goddess of wealth, love, prosperity (both material and spiritual), fortune, and the embodiment of beauty. She is the wife and active energy of Vishnu. Her four hands represent the four goals of human life considered proper in Hindu way of life – dharma, kama, artha, and moksha. Representations of Lakshmi are also found in Jain monuments. In Buddhist sects of Tibet, Nepal and southeast Asia, goddess Vasundhara mirrors the characteristics and attributes of Hindu goddess Lakshmi, with minor iconographic differences. Lakshmi is also called Sri or Thirumagal because she is endowed with six auspicious and divine qualities, or Gunas, and also because she is the source of strength even to Vishnu. Lakshmi is commonly portrayed as a beautiful woman with four arms, standing on a lotus flower. There is usually one, or sometimes two elephants behind her, anointing her with water. She is often depicted sitting beneath Vishnu, massaging his feet. One of the most compelling stories in Hindu mythology is that of the Churning of the Milky Ocean. It is the story of the gods versus the demons and their fight to gain immortality. It also tells of the rebirth of Lakshmi... This story highlights the good fortune and success that Lakshmi bestows upon those who work hard and seek help sincerely. It also demonstrates that during times of success, one must never become complacent or arrogant, as success has a way of getting away from people. The name [Divali] is derived from the Sanskrit term Dipavali meaning “row of lights,” which are lit on the new-moon night to bid the presence of Lakshmi, the goddess of wealth. In Bengal, however, the goddess Kali is worshiped, and in north India the festival also celebrates the return of Rama, Sita, Lakshmana, and Hanuman to the city of Ayodhya, where Rama’s rule of righteousness would commence. Lakshmi, the Goddess of wealth, comes of Her own accord where fools are not respected, grain is well stored up, and the husband and wife do not quarrel. The Goddess of wealth is unsteady, and so is the life breath. It is an extract of the Indian national prayer "Vandemataram"
'īśvara' holds the semantic field: master, lord, prince, king, mistress, queen, a husband, God, the Supreme Being, the supreme soul (आत्मन्), Shiva (शिव), the god of love, Durga (दुर्गा), Lakshmi (लक्ष्मी), of any other of the shaktis (शक्तिs) or female energies of the deities, and it is often glossed 'controller' in English. He [God] is a magician. He simply puts the seed in his imagination –which is Prakriti, Lakshmi or Mother Goddess of the world and the universe comes into existence. O Devi [Lakshmi], whose heart is full of mercy, who is worshipped throughout the three worlds and who is the giver of all fortune and the mother of Creation. All glories to You, o shelter of all living entities. O fulfiller of all desires, You are the wonderful energy of Lord Achyuta [Vishnu], who is maintaining the three worlds. You are the Supreme Goddess... - Bhagavad Gita. Lakshmi, fortune's queen, defend you,... - Sarojini Naidu. O Devi [Lakshmi], whose heart is full of mercy, who is worshipped throughout the three worlds and who is the giver of all fortune and the mother of Creation. All glories to You, o shelter of all living entities. O fulfiller of all desires, You are the wonderful energy of Lord Achyuta [Vishnu], who is maintaining the three worlds. You are the Supreme Goddess. O protector of the devotees, all glories to You. O Devi, it is You who fulfills the desires of the devotees, and it is You who engages them in the service of Lord Achyuta. You are eternal and deliverer of all fallen souls. All glories unto You. O Devi, for the welfare and protection of the three worlds, You take on many forms such as Ambika, Brahmi, Vaishnavi, Maheshwari, Varahi Maha-Lakshmi, Narasimhi, Indri, Kumari, Chandika, Lakshmi, Savitri, Chandrakala, Rohini and Parameshwari. All glories unto You, whose glories are unlimited. Kindly be merciful upon me. Ganesha is frequently depicted with Saraswati, the Goddess of learning and music, and Lakshmi, the Goddess of wealth and prosperity. Since Ganesha is associated with similar attributes as the goddesses, many devotees believe that they are his wives in previous incarnations. This assumption is reinforced by their worship along with Ganesha, especially during Diwali. But no myths support this notion. The deities are worshiped together simply because they represent similar goals. 8)Santana Lakshmi - Goddess of family, bestows followers with children. English translation:Oh God of Fire, invoke for you, the Goddess Lakshmi who shines like gold, yellow in colour, wearing gold and silver garlands, radiating like the moon, the embodiment of wealth. Oh God of Fire! Invoke for me the unfailing Lakshmi, blessed by whom, I shall have wealth, cattle, horses and men. Gentle joy-winds to caress you. ...Purusha was personified as Brahma, Vishnu and Shiva while Prakriti was personified as Saraswati, Lakshmi and Shakti. "An auspicious fortune is attached to their words." men who, knowing that it is virtue, covet not the property of others. And none his glory may prevent. First Diwali day called Dhanteras or wealth worship. We perform Laskshmi-Puja in evening when clay diyas lighted to drive away shadows of evil spirits.In Diwali, goddess Lakshmi visits all people. Cows are worshipped for they are incarnations of Goddess Lakshmi. Sri Kamala Stotram as quoted in ibid. The grace of both Lakshmi (goddess of fortune) and Sarasvati (goddess of learning) now shines on the peoples of the Western countries. They do not stop at the mere acquisition of the objects of enjoyment, but in all their actions they seek for a sort of beauty and grace. During [Durga Puja]...very frequently, small images of Lakshmi, Saraswati, Kartikeya and Ganesha are also placed by the side of the goddess [Durga]. At the close of the festival, these images are immersed into the river. Lakshmi Narayan - Sometimes this Goddess [Lakshmi] is shown as being one with the Lord Vishnu, when then is called Lakshmi Narayan. This conjoined deity denotes that in his supreme state Vishnu is one with his consort, who represents his power and energy. Consorts of all these gods [Brahma, Vishnu, Shiva], are known as goddesses. They are Saraswati — wife of Brahma as well as Goddess of Knowledge, Lakshmi — wife of Vishnu as well as Goddess of Prosperity, Parvati — wife of Shiva as well as Goddess of Power. Deepavali is also considered a festival to worship Goddess Lakshmi, the consort of Lord Vishnu and Goddess of Wealth. A special Goddess Lakshmi pooja is performed in most Hindu homes during this festival. During Deepavali people visit friends and exchange sweets. In the Rigveda [Chapter X, hymn 129) the first enunciation in world’s literature is made of the idea that the Creator willed to create the universe through the idea that the creator willed to create the universe through the agency of a female principle. This idea was expressed in the supposed marriage of heaven and earth and the Sankhya philosophy’s union of Purusha and Prakriti. It gathered so great a strength that later on every principal deity of Hindu mythology had his own female companion, who shares the worship paid to male god, e.g., Sita and Rama, Parvati and Shiva, Radha and Krishna, Lakshmi and Vishnu. [Lakshmi] a, major Hindu goddess who originated perhaps as a mother goddess but who now represents wealth, prosperity and epitomizes the later Hindu (Brahmanical) notion of the active female principle of Shakti in a male deity. According to the Ramayan, she arose from the primal Hindu sea of milk. Identified Lakshmi as the consort of Vishnu. Sometimes this Goddess [Lakshmi] is shown as being one with the Lord Vishnu, when then is called Lakshmi Narayan. This conjoined deity denotes that in his supreme state Vishnu is one with his consort, who represents his power and energy. His [Vishnu's] wife is Lakshmi or Sri, the goddess of wealth and fortune. His place of abode is Vaikuntha (heaven) and his vehicle is Caruda, a giant-sized eagle which often is "shown as a winged human-shaped figure having a break-like nose. Vishnu is the infinite ocean from which the world emerges. One of the most popular and enduring representations of Sri-Laksmi shows her flanked by two elephants in the so-called Gaja-Laksmi images. The elephants shower her with water from their trunks or empty pots of water over her. Laksmi expresses Hindu thinking about kingship and the relationship of the ruler to the fertility of the world. The many goddesses associated with geographical features of the Indian subcontinent suggest Hindu thinking about the relationship between sacred space and spiritual liberation. The goddess Sri, who is also commonly known by the name Laksmi, has been known in the Hindu tradition since pre-Buddhist times. She is one of the most popular goddesses in the Hindu pantheon. She has a considerable body of mythology and worshipped by Hindus of all castes throughout India to this day. The most detailed picture of Sri-Laksmi in Vedic literature is found in the Sri-sukta, a hymn in praise of Sri which is part of an appendix to the Rigveda and which is probably pre-Buddhist in date. This is surely one of the earliest hymns to Sri. As Vishnu's wife, Laksmi loses her fickle nature. As the great cosmic king's queen she is depicted as a model Hindu wife, loyal and submissive to her husband. One of her most popular iconographic depictions shows her kneeling before Vishnu to massage his feet. In her early history Sri-Lakshmi was strongly associated with growth and fecundity as manifested in vegetation. A teeming vitality animated her presence, a power that gave birth inexhaustibly to life. In Pancaratra school Laksmi comes to play the central role in the creation and evolution of the universe as the shakti of Vishnu. In the Pancaratra creation scenario Vishnu remains almost entirely inactive, relegating the creative process to Laksmi. After awakening Laksmi at the end of the night of dissolution, Vishnu’s role in the creation of the universe is restricted to that of inactive architect whose plan put into effect by a builder. Lakshmi alone acts, and the impression throughout the cosmogony is that she acts independently of Vishnu, although it is stated that she acts according to his wishes. Sri-Laksmi is today one of the most popular and widely venerated deities of the Hindu pantheon. 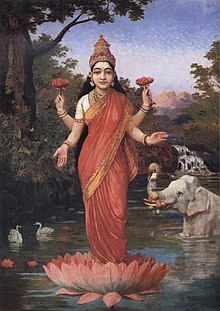 Her auspicious nature and her reputation for granting fertility, luck, wealth, and well-being seem to attract devotion in every Indian village. All of India’s back country is the dominion of Lakshmi, the goddess of the lotus...she accompanies every mile traveled through central India, every visit to a temple...Her likenesses are omnipresent on the walls, pillars, lintels and niches of sanctuaries, regardless of the deity of their specific dedication. Laksmi is worshiped throughout the year in a variety of festivals, and she is the constant object of vratas, "religious vows," by means of which devotees ask her for a blessing in return for undertaking some act of devotion or piety on her behalf. Finally, in Saiva Siddhanta, a southern school of Saivism, Parvati sometimes takes on the role of Shiva's embodied grace and thus comes to play a role somewhat similar to Sri-Laksmi's role in Sri Vaisnavism. Saraswati is also said to have had her origin from the god Vishnu... Her association with Vishnu makes her the co-wife of Laksmi in many myths. In this relationship Saraswati for the most part represents spiritual, ascetic, or religious goals and values, whereas Laksmi represents worldly well-being as manifest in wealth, material power, and fertility. 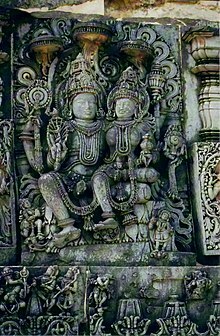 The divinity of Rama and Sita is not stressed in the early Ramayana of Valmiki (written sometime between 200 BC and 200 AD), but they increasingly become identified as manifestations of the god Vishnu and his consort Sri-Laksmi in later texts. Central among these are the nectar of immortality and the goddess Sri-Laksmi. Sri represents good luck, well-being, abundance, and fertility and is well known as dwelling wherever a righteous king reigns. She is sovereignty personified, and where she dwells there always exist wealth and abundance of all good things. She [Sita] is not mentioned very often and is overshadowed by much more popular goddesses associated with fertility, such as Sri-Laksmi. Nevertheless, Sita does seem to be part of a fundamental intuition concerning the fertility of the plowed earth and necessity of a male power to awaken, arouse and inseminate her. When Bhudevi complains that she is being oppressed by a certain demon, Vishnu, attentive to the welfare of the earth, assumes the appropriate form and recuses the earth from her predicament. Iconographically it is common to see Vishnu flanked by Sri-Lakshmi on one side and Bhudevi on the other. Vedic culture, which developed into an agricultural and pastoral society, revered both the earth and cattle. More importantly, significant agricultural goddesses such as Gaja-Lakshmi emerged. In Epic literature attempts were made to consolidate couples (Mithuna) and give single females and males individual personalities. ...there are three varieties of Lakshmi images: those symbolic of agricultural abundance and the king's treasury, as the divine wife who tenderly massages her husband's foot, and as a Yogini rooted in the waters of the ocean. The features of Sri Lakshmi expanded from the notion of fertility of the earth. Several variations of her name are Lakshmi, Gaja-Lakshmi and Sri Lakshmi. The term Sri is used to refer to the splendour and power of a king or raja. Sri is his splendour and dominion. She is associated with qualities such as power, capability, high rank and glory. In the hymn of Purusha Sukta, a supplement to the Rig Veda, Sri is portrayed as a bright, beautiful and embellished goddess. Furthermore the hymn identifies Sri and Lakshmi as one and the same goddess. In other hymns she is considered the luck and light in men and splendid energy in women. She is firm, motionless, and wide. She is the one who gives nourishment, wealth and love. She is asked to pour milk as a mother does for a son. Her breasts are full of nectar which gives long life, and she is praised as the nourisher of all creatures wicked and good, demonic and divine. ...the hymn identifies Sri and Lakshmi as one and the same goddess. Prior to this text a clear distinction was made between the two goddesses. Yakshini images include Salabhanjika (Yakshini on a Sala tree), Vrikshadevata (Tree as female deity) and Gaja-Lakshmi (goddess of wealth). These are vegetative or progenitive spirits directly controlling and bestowing fertility and wealth,or simply abundance. The goddess of abundance and fortune, Sri Lakshmi, reflected the accumulated wealth and financial independence of the Buddhist monasteries. Her image became one of the popular visual themes carved on their monuments. Each single deity such as Shiva, Parvati, Vishnu, SriLakshmi and others is considered personal and the highest god by individual Hindu worshippers. This particular religious perspective resulted in a popular movement in which fervent devotion was offered to the deity of one’s choice. Lakshmi is believed to have emerged from the ocean at the time of its churning by gods on one side and demons on the other. The figure of Mahalakshmi, however, is austere and solemn. All the figures surrounding her, as if magnetized, move towards her. She is the nucleus of the whole composition. ... there are three varieties of Lakshmi images: those symbolic of agricultural abundance and the king's treasury, as the divine wife who tenderly massages her husband's foot, and as a Yogini rooted in the waters of the ocean. The Nilmata Purana states that the goddesses Lakshmi and Uma manifested themselves in the valley as the rivers Jhelum (locally known as Vitasta) and Sindhu, to purify the land. The sources of water are considered sacred by the Kashmiris. All Women Are Embodiments of Lakshmi Whether exhibiting steadfastness or restlessness, nurturing, independence, or any other embodiment or mode of expression. Lakshmi always retains her core essence as the divine feminine. Every one of her forms is specifically female – most distinctly as Radha, Sita and Rukmini who are consorts of various forms of Vishnu. She is prithvi the divine feminine embodied as mother earth... the gods proclaim: You exist as little girls in their childhood, As young women in their youth, And as elderly women in their old age. On the hundred-peaked mountain you are the lovely Sundari. The useful, life-giving currents of gold, of water, of fructifying rains, and indeed of any form of energy are all variations on the same image of Lakshmi's bestowal of prosperity. In some images, elephants lustrate the goddess with streams of water, increasing the magnitude of bounty and also illustrating an important point – that the goddess of plenty herself enjoys replenishment. I am breathless with anxiety and fever. And guide me to a state of propensity. This [.sattva i.e dynamic equipoise.] is Laksmi’s fullness and life-energy, and it expresses what the Greek philosophers put forth: truth is beauty and beauty is truth. Laksmi dwells in expansion and reception: in the fullness of giving and receiving of gifts, nourishment, and pleasure in the commercial exchange of goods and services, and in the ritual exchange of offerings and boons. Whose inhabitants offer songs to Sri.